This section deals with appealing First-tier Tribunal refusals at the Upper Tribunal. If your appeal is refused at the First-tier Tribunal, you can apply for permission to appeal at the Upper Tribunal if you think the First-tier Tribunal judge made an error in the way they applied the law in deciding your case. 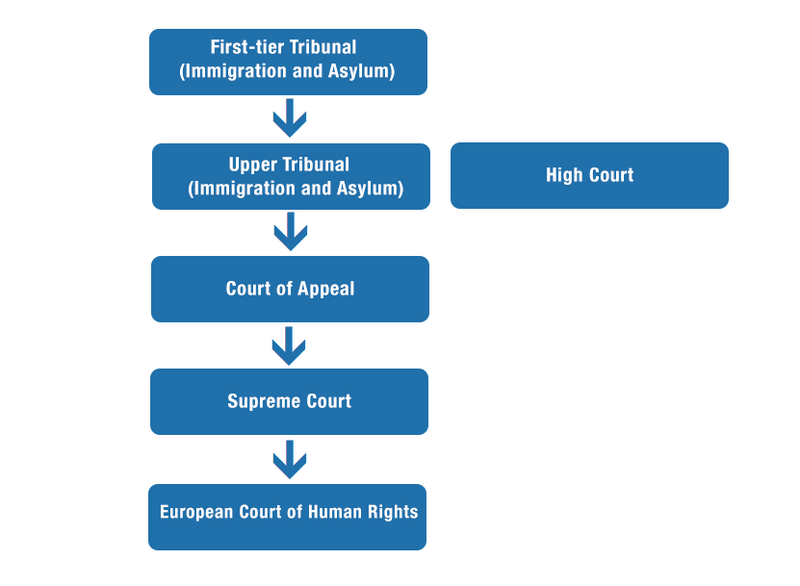 The Upper Tribunal is also where most asylum and immigration judicial reviews are now heard, but this section does not deal with judicial reviews. For information on judicial reviews at the Upper Tribunal, see the judicial review section. In applying for permission to appeal a dismissal by the First-tier Tribunal of your appeal, you need to demonstrate that the judge in the First-tier Tribunal made an error of law in their determination (decision). or where there has been unfairness in the way matters have proceeded. It is essential that when applying for permission to appeal, you set out how you believe the First-tier Tribunal made an error in law. You cannot simply say you disagree with their decision. You do not have the automatic right to appeal at the Upper Tribunal if the First-tier Tribunal dismissed your appeal. You need to apply for permission first. First, you apply to the First-tier Tribunal for permission to appeal at the Upper Tribunal. 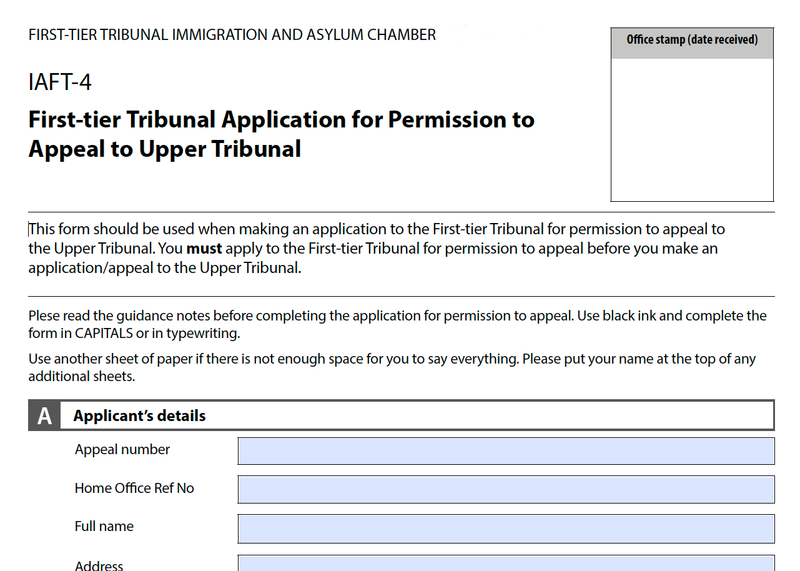 To apply for permission from the First-tier Tribunal to appeal at the Upper Tribunal, you need to fill out a form called IAFT- 4. You should be sent a form with a copy of the First-tier Tribunal’s refusal of your case. You can also find it, along with guidance notes, at the tribunal website. If you are filling out the form by hand, you should use black ink and write in BLOCK CAPITALS. Alternatively, you can fill the pdf form out on a computer, depending which software you have (for example, if you download the form and use Adobe Reader software). Check for up-to-date details at the tribunal website. The application form asks you to state both what error(s) of law you consider the First-tier Tribunal has made, and also and the result you are seeking. You can attach additional sheets of paper if you need to write more than will fit in the space on the application form. When you send your permission application, you also need to send a copy of the First-tier Tribunal refusal you wish to challenge, along with the full reasons why you think the Tribunal made an error of law (including supporting documents/evidence where relevant). Usually, an application to the First-tier Tribunal for permission to appeal at the Upper Tribunal is decided on the papers, without an oral hearing. If you are in the UK, you must submit your application for permission within 14 days of the date the written dismissal of your appeal from the First-tier Tribunal was sent to you. If you are outside of the UK, the time limit is 28 days from the date of postage. If you send the application to the Upper Tribunal so that it will arrive later than the deadline, your application must include a request for an extension of time and explanation of why you were unable to send it in time. The Upper Tribunal will consider whether they will accept these reasons and grant you permission for an “out of time” appeal. There is currently no fee to appeal to the Upper Tribunal. If the First-tier Tribunal do not grant you permission to appeal at the Upper Tribunal, you can apply directly to the Upper Tribunal for permission to appeal there. To apply for permission directly from the Upper Tribunal, you need to complete a form called IAUT-1. You can find the form, and guidance notes, at the Tribunal website. You send the completed form by fax or post to the Upper Tribunal. The postal address is: Upper Tribunal (Immigration and Asylum Chamber), IA Field House, 15-25 Breams Buildings, London EC4A 1DZ. The fax number is 0870 3240111. If you are detained you will need to submit the application to your detention centre. See the tribunal website for up-to-date information. 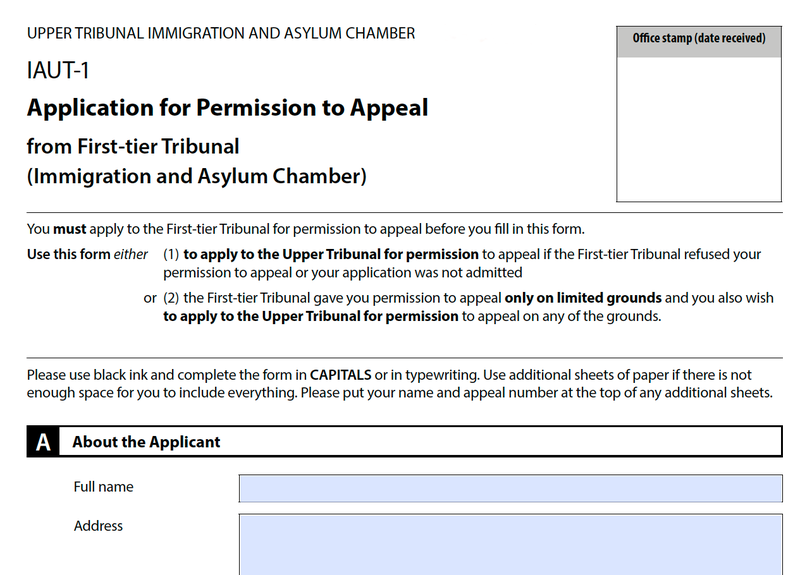 If you are in the UK, the form should be completed and sent to the Upper Tribunal no later than 14 days after the date on which the First-tier Tribunal’s refusal of permission was sent to you. If you are outside of the UK, the time limit is one month. The time limits are even shorter if the First-tier Tribunal’s decision was emailed to you or handed to you in person, rather than posted. Contact the Tribunal to ask them about time limits if this is the case for you. In your application for permission to the Upper Tribunal, you need to explain what error(s) of law you believe the First-tier Tribunal made. Provide evidence where possible. When you send the application, you also need to send a copy of the First-tier Tribunal’s refusal/dismissal of your appeal, and the “notice of refusal of permission to appeal” sent to you by the First-tier Tribunal or the “refusal to admit the application for permission”. In the application, you need to say whether you want the application for permission to be considered at an oral hearing. An oral hearing means you will be able to give evidence and speak to the judge about the errors of law you believe the First-tier Tribunal made. If you want an oral permission hearing, you need to give reasons why. You are also asked whether, if given permission to appeal, you want that appeal to be through an oral hearing or decided on the papers. The opportunity to speak to the judge and give evidence in person may be important for making your argument. The tribunal can decide to have a hearing even if you don’t ask for one. If you find writing English difficult, a friend or supporter may be able to help you to fill out the appeal form. You need to tell them what to write, and they write it on the form. They should read back everything they have written for you, to check it is correct. You may be able to apply for a judicial review of the refusal of permission to appeal at the Upper Tribunal, if you can demonstrate an error of law that raises an important point of principle or practice or show some other compelling reason for the case to be heard. Sometimes the Home Office receives the refusal of permission to appeal to the Upper Tribunal and does not notified the appellant. They then detain the individual (either at a reporting event or through a raid on their home), at which point they inform them of the Tribunal’s refusal of permission. If you are granted permission to appeal to the Upper Tribunal, there will be either a hearing before one or more Upper Tribunal judges or the case may be decided without an oral hearing, on the papers available. The Upper Tribunal will send you Directions setting out the steps that are required to be taken before the hearing. Make sure you read these carefully, and follow the instructions within the time-limits given in the Directions. You may wish to submit written submissions (a summary of your case) and/or a skeleton argument (sets out the main arguments you wish to rely upon at the hearing) to expand on the grounds you used to apply for permission to appeal. You should explain in these documents why you think the First-tier Tribunal made an error of law. If you wish to submit these documents, you need to send them to the Upper Tribunal and the Home Office in advance, as per the instructions in the Directions. If you want the Upper Tribunal to consider new evidence, you must submit it to the Tribunal and the Home Office in advance, explaining why it has not been submitted before (in your original application or first appeal). You need to bring the originals of any documents with you to the Tribunal. These documents must be in English or be officially translated. If you need an interpreter and did not say this in your permission application, you must notify the Upper Tribunal, informing them which language and dialect you speak. You can ask for a male or female judge if you think there are issues in your appeal that make it appropriate. The Upper Tribunal will decide if it can do this. If you are unable to attend the hearing, you must tell the Upper Tribunal as soon as possible and ask for the hearing to be adjourned to a different date. If this is because you are ill or have a medical appointment you need to send evidence of this when you apply for an adjournment. A judge will consider this and you will be told whether the hearing date has been changed or not. You may not be able to take young children into the hearing with you – wherever possible, arrange childcare for the day of the hearing, and remember you may be at the Upper Tribunal all day. If your address changes after you have submitted your appeal, you need to notify the Upper Tribunal. You also need to notify the Upper Tribunal if you change lawyer (or you no longer have a lawyer). Hearings are in public, so when you have your hearing there may be members of the public in the room too. If you do not want your hearing to take place in public, because you fear for your safety or because of the sensitive nature of your case, you can request that the hearing takes place in private. You should do this well in advance of the hearing. You can also request “anonymity directions” so that any materials about the hearing in the public domain including the written record of the court’s decision (which may be published publicly including on the internet) does not contain your name. You can find the application for anonymity and guidance here. Your case will be listed for hearing at 10am or 2pm on the date you are given on your Directions. The judge will decide on the day the order in which the cases will be heard so you may have to wait until later in the day for yours to be heard. You might want to bring some money with you in case you want to buy drinks or refreshments, although you will usually be provided with water in the hearing room once your hearing has started. You should arrive early at the Upper Tribunal – the Upper Tribunal guidance recommends arriving one hour early in order to get through security in time. If possible, visit the Upper Tribunal location in advance, so you know how to get there and where you should go. You may live a long way from it, however, so this may not be easy to do. The Upper Tribunal for England and Wales is in London: Field House, 15-25 Breams Buildings, London, EC4A 1DZ. If you are representing yourself (you do not have a lawyer), remember to bring all the necessary documents with you. This includes your Hearing Directions and any documents you want the judge to consider. On arrival at the Upper Tribunal you should go to the reception area where you will find a list of the day’s hearings on a notice board. The order of the list may change during the day, meaning cases are not heard in the same order as they appear in the list. It is important to keep in touch with the clerk if you are waiting outside the hearing room. Report to the receptionist, who will tell you where your appeal will be heard and the name of the judge or panel who will hear it. Unless you are asked to wait in the reception area, you should go to the allocated court room and wait outside the door. Shortly before the start of the hearing, an Upper Tribunal clerk will arrange for you to take your place in the hearing room. If no one has approached you, go back to reception for assistance. The hearing is usually held in a room with desks and chairs. The judge will sit at the front of the room (they will come in after you) at a desk or table and the other people sit at tables and chairs in front of him/her. The Home Office representative (Home Office Presenting Officer, or HOPO) will usually sit on one side of the room, and you will sit on the other side (with your lawyer, if have one). The Home Office do not always send a HOPO to attend. The hearing will usually go ahead anyway, with the judge asking more questions. Your appeal will probably be heard by one judge. Occasionally, more than one judge will sit as a panel to hear your appeal. You may turn up for your hearing, and find out the Home Office are asking for an adjournment for some reason. If this is granted by the judge, the hearing will take place at a later date. Mobile telephones must be switched off whilst in the hearing room. You cannot record the proceedings or take any photographs. If you need an interpreter they will sit next to you. They will interpret the proceedings to you in a low voice or whisper, either while people are speaking or after a statement has been given. You should call the judge ‘Sir’ (if they are a man) or ‘Madam’ (if they are a woman). You will be asked to stand up when the judge enters the room. After that there is no need to stand until the end of the hearing when the judge leaves the room. You can stay sitting down when you address (speak to) the judge. This information is for if you do not have a lawyer representing you. If you have a lawyer, they will address the judge and give the legal arguments, but you will also have to give evidence. You will normally give your evidence first as to why your appeal should be allowed. Remember for an appeal at the Upper Tribunal to succeed, you must demonstrate that an error of law was made in deciding your appeal at the First-tier Tribunal, and not just say you believe they got the decision wrong. You will then be asked questions by the Home Office Presenting Officer and perhaps by the judge. The Home Office Presenting Officer will then address the judge and say why they think the appeal should be dismissed. It may be useful to take notes while they do this as you may want to respond afterwards to what they have said. You will then have the last word to explain why your appeal should be allowed (responding to what the Home Office Presenting Officer has said, if you can). In advance, you might want to write down a summary of the key points of your argument, to remind yourself what you want to say. You can give a copy of this to the judge if you want, as long as you give a copy to the Home Office presenting officer as well. If you have several points to make—for example make this clear. You can say “my first reason is”, “my second reason is” etc. Try and stick to one reason at a time, without mixing up different areas of argument (though if the areas of argument are connected, you can say this). You can’t interrupt the judge, the Home Office presenting officer, or a witness if they are in the middle of talking. If you think the judge is moving on to the next part of the hearing and you haven’t finished what you wanted to say, you can raise your hand. You may be feeling nervous about going to court. You can ask a few friends or supporters (not too many) to sit in the court room in the public area, for moral support. They are not allowed to speak or make any interventions in the proceedings, but it can help to have a friendly face or two in the room. You may even want to practice by doing a pretend hearing with friends/supporters, with someone playing the judge and someone else the Home Office Presenting Officer. As hearings are public, you have the option to going to watch someone else’s hearing in advance of your own. Think about whether you think this would be helpful or not. The judge will either make a decision then-and-there, or they may “reserve” their decision and let you know in writing at a later date. If the judge makes the decision then-and-there that the First-tier Tribunal made an error of law, they may proceed to hear the appeal so they can make a fresh decision immediately, or they made decide that it is necessary to hear new evidence or consider new documents and so they will arrange a hearing at a later date. The judge will decide whether any findings of fact made by the First-tier Tribunal are to be preserved, even though the First-tier Tribunal’s decision has been set aside. The judge may send the case back to the First-tier Tribunal (“remit the case”) to re-decide the case, with no need for consideration of new evidence. The judge may give the First-tier Tribunal directions to make sure the error of law is not repeated. This is a possible outcome if the Upper Tribunal judge agrees with the First-tier Tribunal on findings of fact. The judge may order the First-tier Tribunal to rehear the case, with a chance to hear new evidence. This is a possible outcome if the Upper Tribunal judge decides the findings of fact by the First-tier Tribunal can’t be relied upon. If you were granted permission to appeal at the Upper Tribunal, your case was heard, but the judge decided that the First-tier Tribunal did not make an error of law, there is the option of appealing that finding at the Court of Appeal. You will need to apply for permission to do this. Accessing this level of the court process without a lawyer is very tricky.